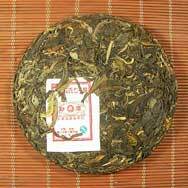 This Green Label Mengku Rongshi Tea Cake is produced from ShuangJiang Mengku Teji (special grade) tea leaves which was awarded gold honor in the 2002 International Pu'er Excellent Product Competition. It is now one of Meng Ku Tea Company's flagship product. Highly recommended to Pu'er tea cake collectors. This is an interesting cake. It smells first rather heavy, after rubber and typical fresh sheng, but when you unwrap it, it gets lighter and much rounder... The first magic happens when you pour hot water, rinse and smell again. Wet tobacco and a very special smell appears which cannot be described easily, it reminds me of something very ancient.. The second magic comes when you make the first infusion. I was careful first and used colder water cca 80ºC (5g/80ml), given the smell I expected heavy smoky tones and astringency, but to my surprise none of them were really present in the first cup. The cake was pressed rather tight but according to the wrapper it was 5 years and 5 months ago and you can really feel it. The tea broth is beautifully dark golden, it tastes mellow, somewhat tobaccoish.. In the second and third infusions I identified dry cherries and it was really nice surprise as I really like the smell of cherry pipe tobacco. This tea has a nice huigan, too, which can be experienced more in the third and later infusions. Nice tea. A very nice green tea. It tastes nice and gives many beautiful infusions. I broke one and put the other aside for further aging. I think it will improve well. An excellent tea to stock. It will age very well. I ordered one bing cha to taste it. 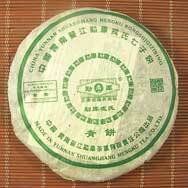 It´s one of the best relatively yong sheng i have tasted. To weeks later i orderd five tongs of Quin Bing Cha 06. I will let it age a few more years and i bealive it will be a geat tea five or ten years. 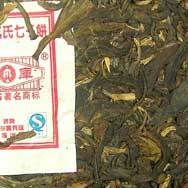 Strong, aromatic tea with bitter tannins. Will take time and patience for it to mellow.